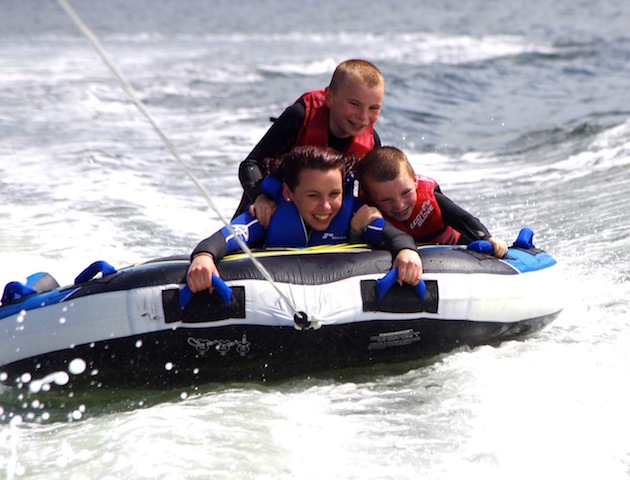 Our towed inflatable rides around our 100 acre loch at Wetjets Park Dumfries are perfect for the whole family to enjoy on a warm summer’s day. We’ll take you and your family for a thrilling 15 minute ride across the loch that will leave you gasping for more! Why not enjoy a meal afterwards in our restaurant overlooking the loch? Children must be aged 4 or over and accompanied by an adult. Wetsuits and buoyancy jackets provided. We’re open from Easter to October. Book your session now or call us on 01556 690281 for more details. N.B. Age restrictions apply, see our Terms & Conditions.